Could an Antiwar, Anti-Surveillance Libertarian Be the Biggest Beneficiary of Trump’s Takeover of the GOP? 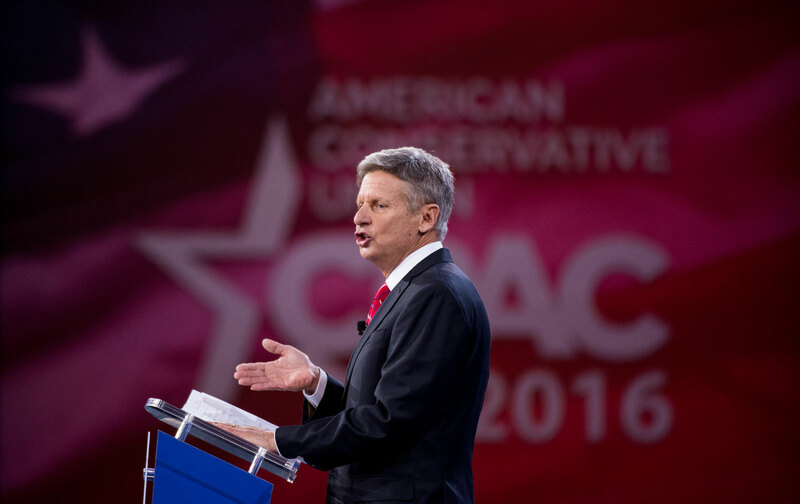 Gary Johnson is making his play for #NeverTrump votes. But is he too open-minded for renegade Republicans? Shortly after Donald Trump crushed Ted Cruz in the Indiana primary that the Texan’s backers has set up as the final “firewall” against the billionaire’s seizure of the Republican Party, one of the GOP’s most ardent #NeverTrump activists was casting his gaze across the party line. That wasn’t any kind of formal endorsement. But Steineke, who announced that he was relinquishing his position as an alternate delegate to the Republican National Convention in July was “#JustSayin” to reporters in Wisconsin, “At this point there is not a major party candidate who has earned my vote.” And the legislator was generous enough to tweet not just a reference to Johnson but a link to the Libertarian’s website—where Johnson seeks support from politically homeless #NeverTrumpkins. Johnson is, like most Libertarians (and some Republicans), a big critic of big government—he says Milton Friedman is his favorite political philosopher, and calls for abolishing not just the Department of Education but also the Department of Housing and Urban Development. He also supports “entitlement reforms” so sweeping that they would make Paul Ryan salivate. The Republican Party is in crisis. In a fully functional, multi-party democracy, where voters had a wide range of viable electoral options, the crisis would in all likelihood lead to a smooth transference of mainstream Republican votes to credible alternative party or to a new party. But the United States does not have a fully functional, multi-party democracy. The United States does not even have a moderately functional democracy. So we are in uncharted territory here. Some responsible Republicans (and there are still a few) and some sincere conservatives (and there are still a few) will vote for Hillary Clinton if she is the Democratic nominee. There are others who will simply refuse to vote. But there are many Republicans who are looking for an alternative. Some are still talking up the prospect of an independent run by one of their own—such as Nebraska Senator Ben Sasse—but that would require a fast and furious (and very expensive) fight for ballot lines. The Libertarians already have more than 30 ballot lines and, with Johnson on them, they might well be able to stake a claim on a chunk of #NeverTrump votes. Indeed, the magazine Reason reports that, on the night of the Indiana primary, shortly after Trump was positioned as the GOP’s presumptive nominee, Google Trends detected “a surge in searches for ‘Libertarian Party’” on the Internet. And when pollsters have included his name in their survey—a rare circumstance up to this point—they have detected something of a surge in support for Johnson. A March Monmouth University poll had Johnson at 11 percent, compared with 34 percent for Trump and 42 percent for Clinton.